This Kreature was designed for countering enemy ambushes. It will unleash exploding seed pods and streams of corrosive pollen to force its victims out of hiding before it swoops in to tear them apart with its powerful jaws. 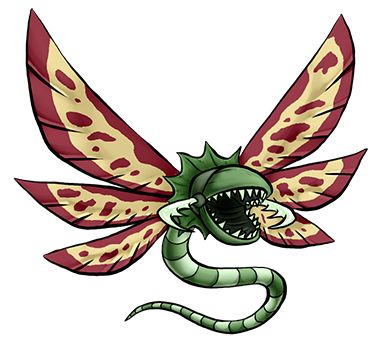 Its six, wing-like leaves are razor sharp, and enable it to hover backwards, sideways and even upside-down. Its long, single root is a versatile appendage; it will use it to keep its balance in flight, coil around prey, hang from branches, or as a flagellum to pursue its target underwater. Its roots and leaves are edible, and can grow back after being harvested, but they should be trimmed instead of removed so that it can continue to fly.